Not so long ago, it was time to celebrate Mom. Now, the time has come for Dad to get a little love and recognition! Father’s Day is right around the corner and it’s a great time to spend honoring that special man in your life. Whether he’s your grandfather, husband, or your Dad, a father needs to be shown that you care. 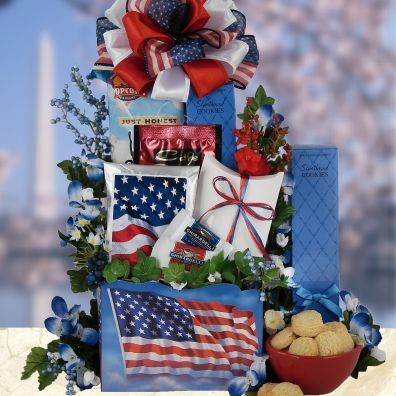 At BisketBaskets.com, we want to make it easier than ever for you to find the right kind of gift for that special kind of Dad. With our selection of Father’s Day gift baskets, you should be able to find that perfect little something for celebrating the occasion while appealing to his unique personality! He’s into sports, sports, and more sports! If your Dad has a competitive side and enjoys a good athletic contest, it’s best to indulge him with a gift that can keep him active. Get him some tickets to a baseball game and celebrate before and after with The Sportsman Father’s Day Gift Basket. Your Dad loves to spend time hunting, fishing, camping, and hiking. If there’s something to do outdoors, he’s totally in. Sure, his sense of style may be a whole lot of flannel and hiking boots, but he still knows how to kick back and enjoy life! Celebrate Father’s Day with an Outdoorsman Gift Basket. This is a guy who LOVES to entertain and socialize. Your house is party central all summer long and your Dad can often be found manning the grill or serving drinks to all of his friends and family. 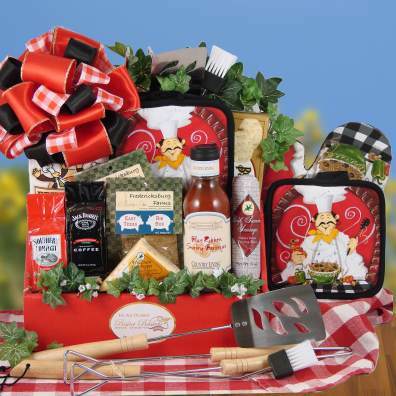 Serve up a great gift to dad by gifting him with the Dad’s Barbecue Basket. If your father is business-minded and into the corporate scene, give him a gift that any CEO would appreciate. The Executive Dad is all about busy schedules, climbing to the top, and providing the best life possible for his family. He’s hard-working, creative, and ready to take on any challenge. The perfect gift: our Time for Dad Gift Basket. Many of us Americans view this day as the welcoming of summer. A truly welcomed weekend especially after the long winter months many of us experience. Falling at the tail end of May each year, we are experiencing the rebirth of our land as the grass greens, flowers bloom and our trees become full of leaves again. As we look forward to this enjoyable time we spend together with family and friends over gatherings in backyards or parks across the country, don’t forget to stop and take a breath. Remember those around you who are in reverence to the real meaning of this glorious weekend; a true celebration of our nation’s heroes. Originally called Decoration Day back in 1866 in Waterloo NY a druggist (Henry Welles) wanted to honor those who died in the Civil War. Union Army Brig. Gen. John Murray both a customer and friend joined together to lead Waterloo in its first observance of Decoration Day. To honor the fallen soldiers, flags were lowered to half-mast and a parade route included three local cemeteries so respects could be paid. By 1868 President Ulysses S. Grant was presiding over a similar ceremony in Arlington National Cemetery and the pressure was on to claim May 30th as a national holiday. After World War 1 in 1954, Decoration Day was now including not only Civil War’s fallen heroes but World War 1 fallen heroes as well. In 1971 Congress renamed the day to Memorial Day and changed the date from May 30th to the last Monday in May therefore offering the American worker another 3-day holiday weekend. We at BisketBaskets.com wish to extend our most sincere appreciation to all our members of service. We thank you from the bottom of our hearts for the service you provide to us to keep us safe here at home and abroad. Your unselfish act of patriotism knows no boundaries and we thank you for serving our great country.